Little surprises can often be the best: Two weeks ago on Islay friends of mine gave me the little yellow box you can see in the picture on the right. I decided to keep it until my birthday even though I was very curious about the content. Well, I knew what was in the box, after all they had told me it was chocolate with Laphroaig. But I didn't know how it tasted and regular readers will know that I quite like Islay whisky and chocolate. When my birthday arrived I wasn't disappointed. Far from it. They tasted fantastic. Inside a red-brown (!) chocolate case was a chocolate-whisky (or whisky-chocolate?) mousse. The whisky taste wasn't overpowering, but still very distinct. Just right. I decided to enjoy them slowly, last night I had the last two. If you ever make it to Winsum (which is about 10 miles north of Groningen in the north east of the Netherlands) I recommend a visit. The other chocolates he does also look very interesting. 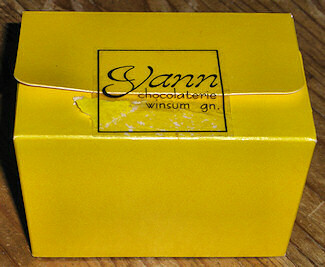 Not to forget: Of course thanks again to the couple who gave me the chocolate. You know who you are.